1) What do you want the plant label to look like? Do you prefer a decorative marker for a special plant that doubles as garden art? Or just something functional and cheap? No fuss + no frills! 2) Do you need a temporary or permanent solution? These include wood (eventually breaks down) and metal (e.g. can lids will rust). Try reusing old wire coat hangers, bamboo skewers, timber offcuts & stakes, chopsticks and wooden pegs. These include plastic, painted or sealed surfaces, china or clay, tiles, stone, concrete, laminated labels, glass, stainless steel or galvanised items. 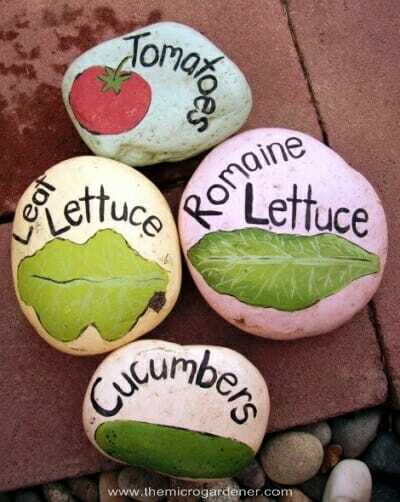 Try repurposing plastic containers, paint stirrers, smooth rocks and bricks/pavers. 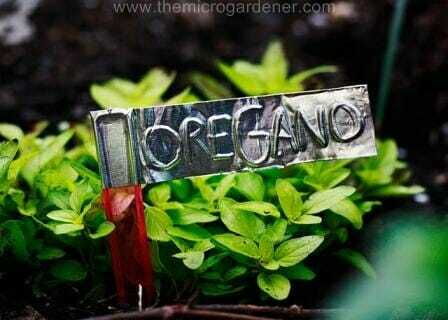 These plant labels are long lasting and easily changed. You have plenty of scope for getting creative with this one. If you want a surface you can write on and can’t find a blackboard paint, I’ve used a non-toxic acrylic matte black paint. It does the same job and is much cheaper! Sample pots are only a few dollars and are great for small projects like this. 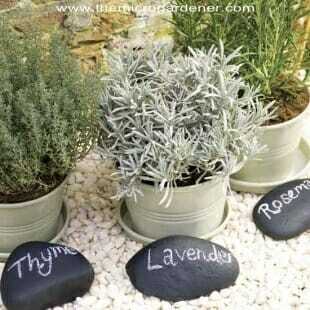 Blackboard paint pot labels – great for feature pots. There are plenty of eco-friendly paint options without the chemical ingredients in traditional products. These are long lasting and there are so many creative options! Use a fine paint brush and acrylic non-toxic paint. These cute markers are made with a little imagination & a stencil kit. A simple stone and stencil marker. This is a fun project for the kids too. Could keep them occupied for hours! 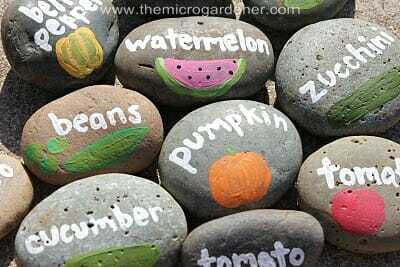 If you’re handy with a paint brush, pick up some pebbles at the beach and create some bright garden art. These classy rock markers would make a great gift. Painted black with a packet of chalk, it’s a wonderfully easy DIY plant label gift idea for gardeners. Colour co-ordinate for contrast … like these black rock herb markers against the white pebbles. Black on white is another version to try. 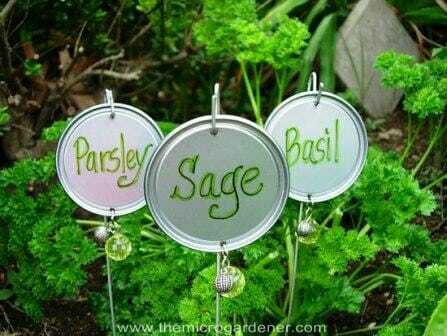 Whilst this takes a little more skill and you need a letter stamp kit, these stamped spoon plant markers are garden art in themselves! They are made using letter stamps. Check out the tutorial via Bunny Hill Blog. Whilst these might take a little more time and effort to make, they add a decorative vintage look to your garden. 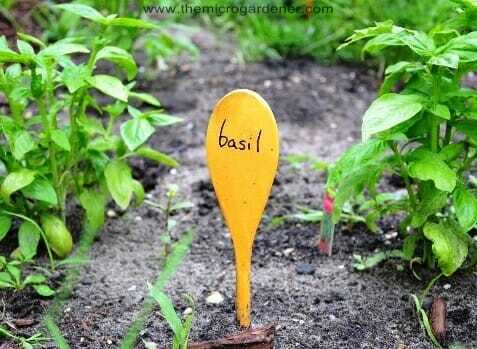 Add a whimsical touch to your veggie patch with a spoon plant marker. 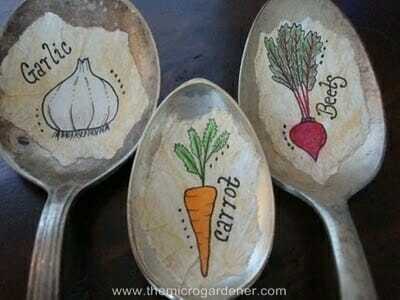 See the tutorial below for how to make these decoupage vintage spoon markers. 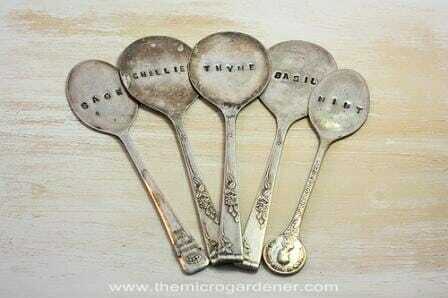 Recycled Spoon Garden Marker tutorial from Domestic Simplicity. 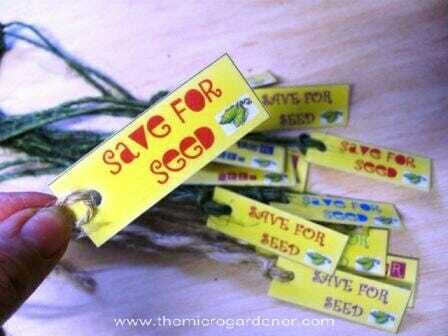 Use paper, contact adhesive, magazine pictures or even the image from your seed packet. 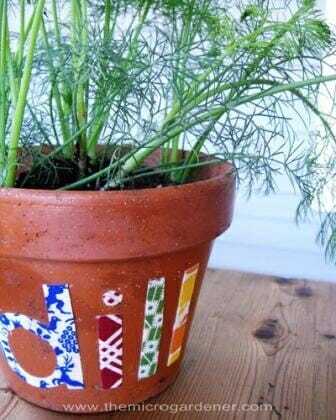 Cut out lettering and glue to your pot. Now for some free and low cost ideas you can make with all sorts of materials. These are all easily upcycled into plant labels. Sometimes pots and crockery break. Don’t despair! It may be an opportunity in disguise. 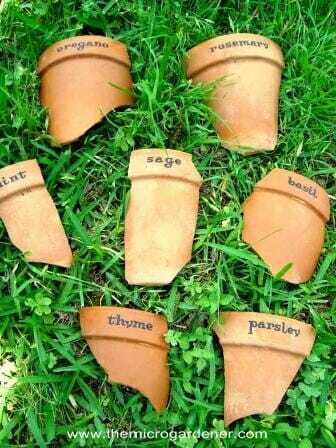 I’m often upcycling broken pots in creative ways for my garden. Add a label to the broken shards or whole plates/pots. Here are some creative ways to use them. Made by gluing metal wire ‘stakes’ to the back. Then painted with acrylic outdoor paint & some rub on letters added & finally adhesive spray for staying power. Simple & eco-friendly. With a marker, stencils or vinyl sticky letters just add the name of the plant on the broken pot piece & pop in the ground! 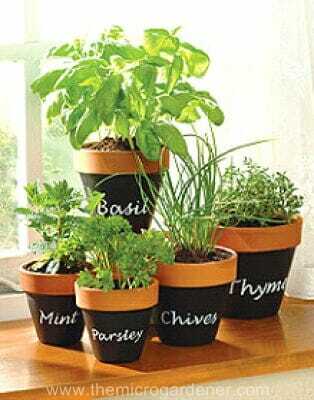 Up end a small pot & use a permanent marker to label. Easy! I save seeds from my garden. However, there’s nothing worse than having an incredibly high yielding food crop but not remembering where you sourced the seed or which variety it was! Here’s a neat solution. 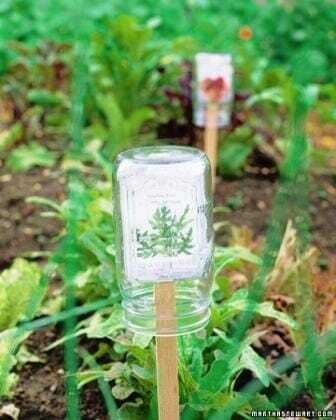 One of the best ways to protect your seed packets with all the info you need to remember is to slide it over a stake and cover with a glass jar – plus it’s weatherproof! 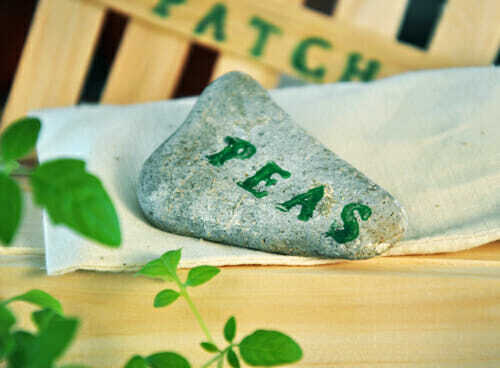 Save wine bottle corks, old mats or off cuts from cork tiles for repurposed plant labels like these. Doesn’t get simpler than this! Label cork and peg to the side of your pot. 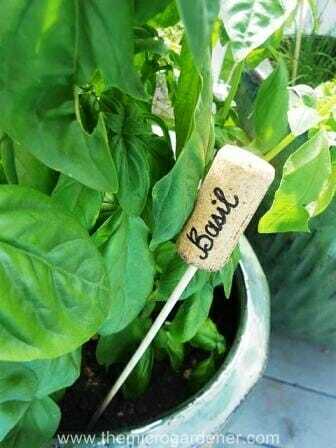 Stick a labelled cork on the end of a bamboo skewer = a low-cost, eco-friendly option! Next time you open a can or container, save the lid. 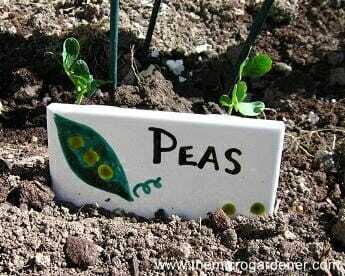 Here are some ways to reuse them to label your plants. Made with coat hanger wire, lids, permanent marker and some decorative beads. The letters on this label are stamped and coloured with permanent marker, then attached to a fork ‘stake’. 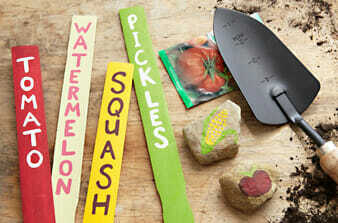 Make these stake markers by reusing lids and gluing images from your seed catalogue. This is the material real estate signs are made from. 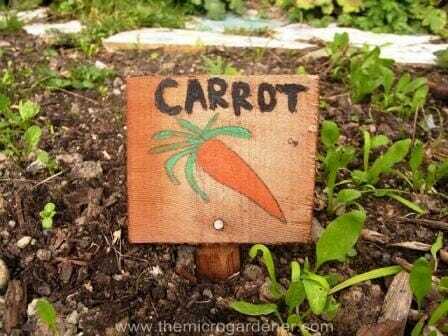 After use, the signs can be recycled into weatherproof plant markers. These are some I made with the kids at school. We stapled the corflute to a timber stake and the students had great fun decorating it with sticky coloured contact, markers and buttons. Here we cut out the letters from sheets of contact and hot glued buttons and chenille sticks to decorate with flowers. Design your own labels on the computer, print off and cover in clear contact. Make sure it’s sealed well around the edges so the plant marker is waterproof. These are a fun waterproof label for kids to help design and cut out. Secure to a peg ‘stake’! Use up old tiles to make weatherproof markers. Most tiling shops have a throw away bin with odds and ends. Or you may have some leftover from a renovation porject. Paint or stencil with plant names and pictures. Painted sign on a ceramic tile. 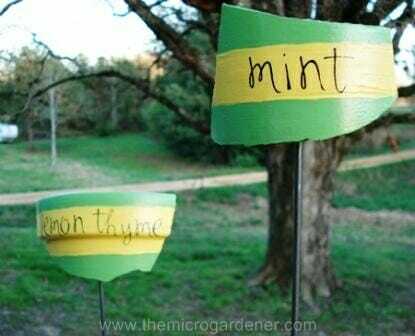 These plant markers provide you with all the plant information you need and are waterproof. 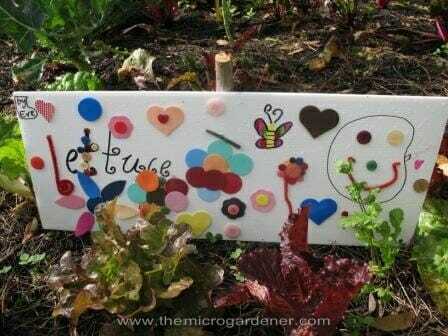 Cute and colourful, this is a fun project for school gardens and children to take ownership of their patch. 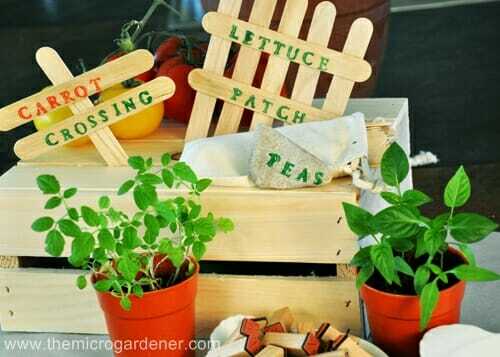 Great project for kids to make for their container garden or veggie patch using paint and stencil lettering. Pegs are so convenient to use and cheap. 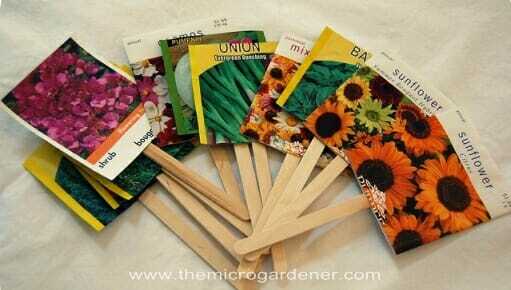 They are pegged easily onto seed raising trays and seedling pots. 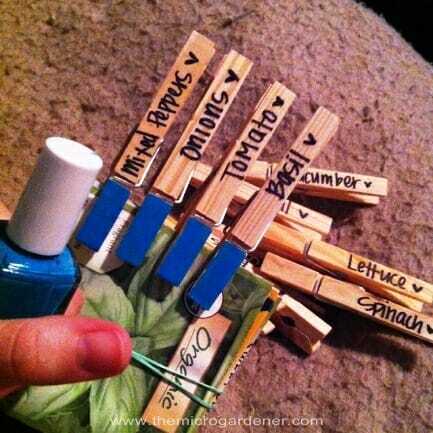 Label pegs with permanent marker and decorate with old nailpolish. These labels are quick and easy to make. 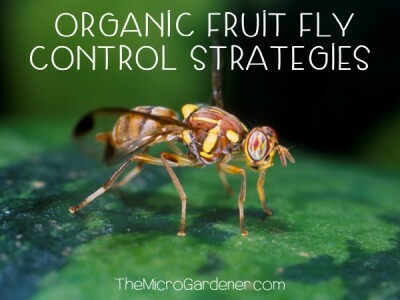 They may also be useful to ward off birds from eating your fruit. 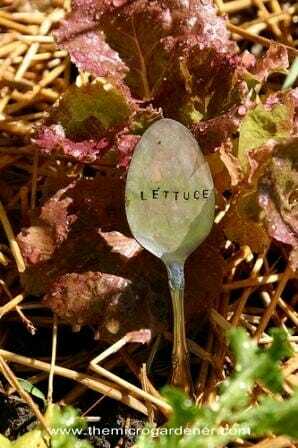 To make these neat little markers, attach adhesive aluminium duct tape to a plastic knife ‘stake’ and engrave the plant name backwards on the reverse of the label with a pen. Then it will read correctly from the front! Recycle whatever materials you have access to. Milk and juice bottles or just about any plastic container with straight sides can be cut and used for labels. 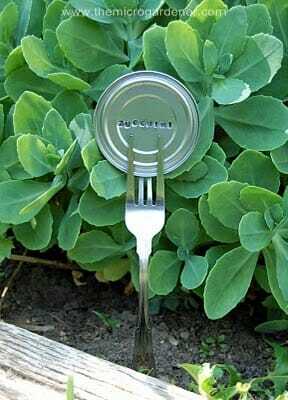 You can also use ice cream lids or even old plastic picnic cutlery. 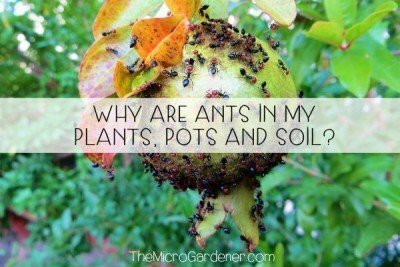 Just poke in the soil. 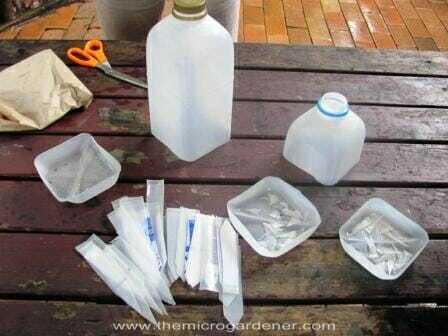 Follow my tutorial to make your own labels from plastic bottles plus other money saving garden supplies. I make labels by cutting the sides out of milk bottles and cutting a point in the end. You can just as easily make your own tag by cutting strips from a plastic icecream lid; punching a hole and using a twist tie. Reuse timber off cuts and use up leftover external paint to fashion some simple plant labels. 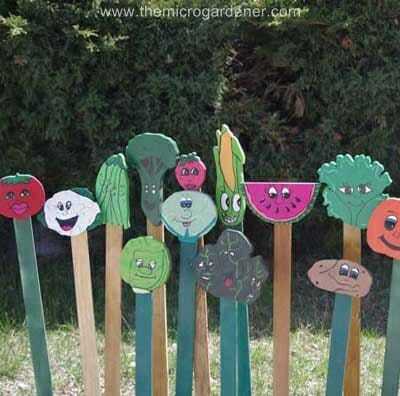 How cute are these colourful wood markers for a family or kids veggie patch? 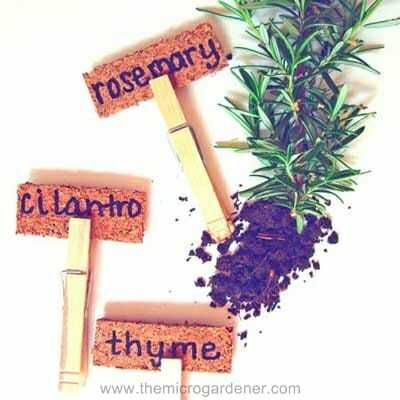 Wooden plant markers made with paint stirring sticks – brilliant! 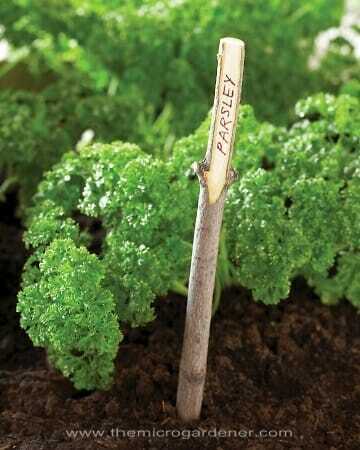 If your wooden spoons have seen better days or the handle breaks, find a new use outdoors as a plant label. Prune some straight twigs or thin branches. 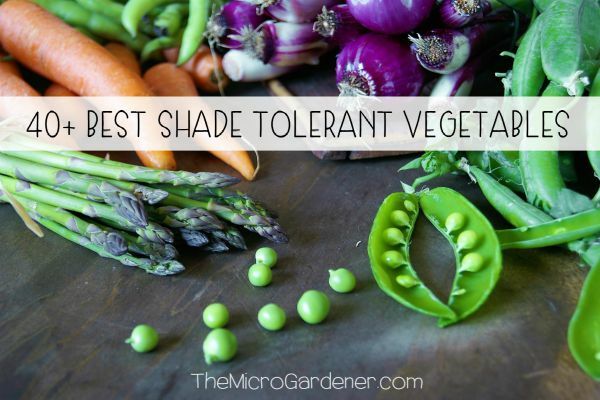 Use a vegetable peeler or sharp knife to slice a flat surface. As the wood will decompose in the weather, use it as a temporary label. 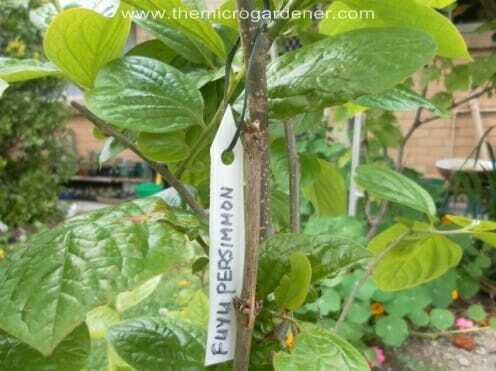 Use a fine permanent marker on your twig label. 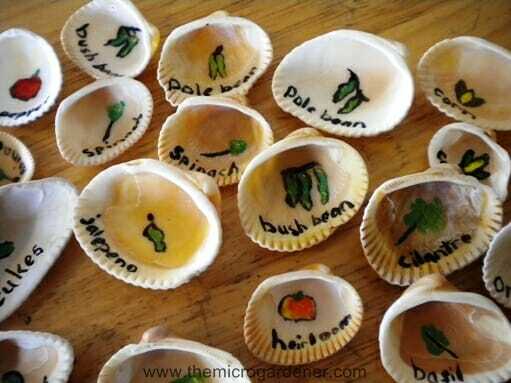 Save your shells and add a little creative flair. Cover with a clear gloss if you wish. For identifying plants that I want to save seed from, I use a bamboo stake right next to the plant stalk. I tie my reusable label with string to the stake for easy identification. 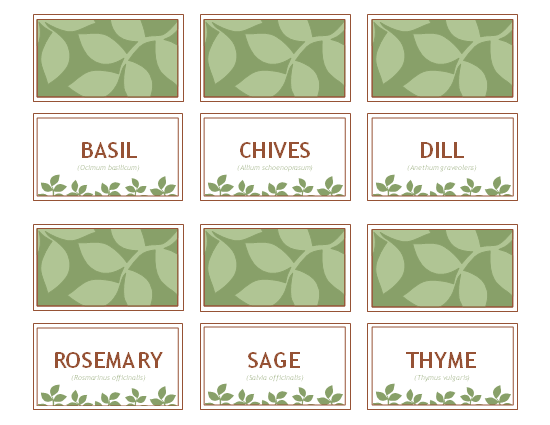 Home Made ‘Save for Seed’ Labels – design your own on the computer, print off & laminate. These last well outdoors when laminated. All surface solution – One of the best tips I can share from personal experience is to use Chinagraph, wax or grease pencils. This is a little known secret in the horticulture and design industries. These wax pencils can be used on just about any surface including plastic, glass, stone and metal and come in a variety of colours. The brand I use is called Lumocolor. I’ve found yellow and white are easily visible on black surfaces. Black or blue work well on pale coloured pots and terracotta. They’re cheap (especially if you buy from a wholesale art supplies store – cost me A$1.55 rather than the garden nursery – around A$3.95!) and they last a very long time, so are great value. They work well on seed raising trays and flats and this is important because they are always wet. The other advantage is you can remove the label by rubbing with paper towel when you want to change it. Permanent Marking. I’ve tried using permanent markers outdoors but how long they last depends on your climate. 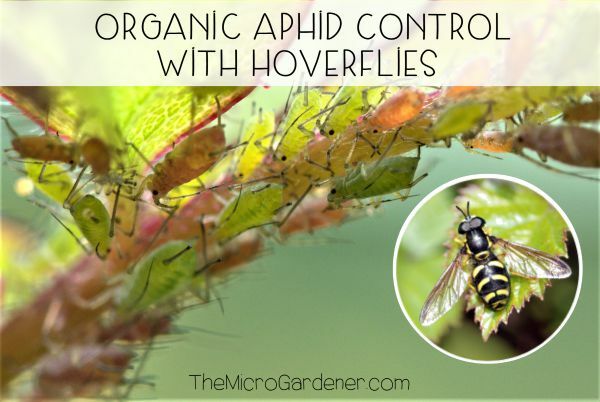 Whilst they work well in dry situations (under cover or short term), it can be a struggle to stop them fading in strong sun or wet weather. Try coating with a clear spray varnish or a coat of clear nail varnish to seal the label. Snap It. 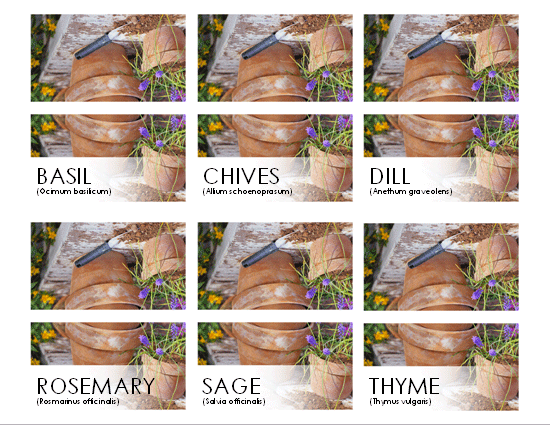 Keep a digital photo record of your plant labels that come with plants you buy. Store them on your computer or print off and laminate for a permanent weatherproof plant label that won’t fade. A cheaper alternative is to buy a roll of sticky clear contact paper that you use to cover books with. 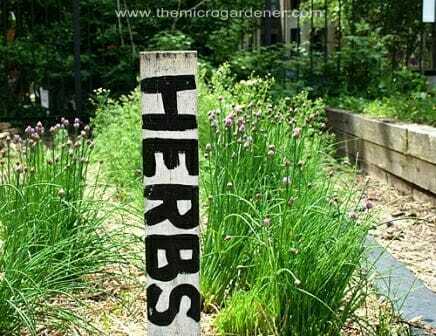 “Laminate” your plant labels both sides – just leave a good seal around the edges when cutting to size. 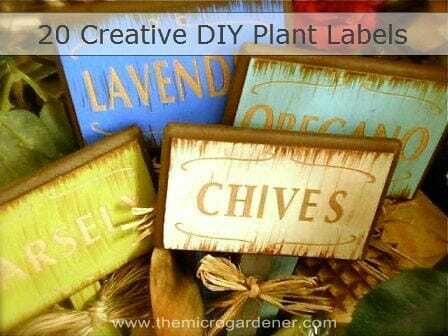 I hope these ideas helped inspire you with some cheap and decorative solutions for DIY plant labels. 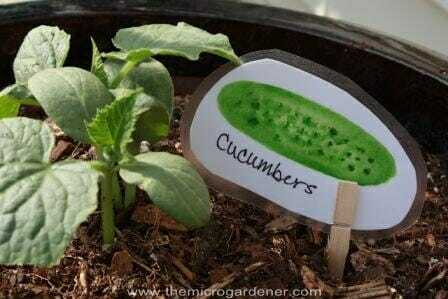 More plant marker inspiration in DIY Repurposed Garden Projects. What’s your favourite plant label idea? Corflute is marketed as coroplast in Canada. Not all coroplast is equal: White and red fall apart faster in sunlight. Blue and yellow hold up well. Best marker I’ve found is Artline 400. It’s a paint pen marker. On Coroplast it lasts 5 years. Another cheap easy to make tag are old venetian blinds. One used blind (a few bucks at a surplus store) makes hundreds of stickers. Or ask at a blind shop for the trimmings. Might not be long enough. Larger metal stamps work well in wood. If you put a drop of paint on stamped letters, and immediately wipe off, the paint will fill the lettering. Canadian Beer cans can be cut with scissors. Lay strips over a pad of paper or magazine, and stamp. A chunk of coathanger or stiff wire bent double allows coroplast signs to be stuck into a pot. Run the wire through 2 flutes. hi, I love your signs! I have some white ceramic tiles left over from my bathroom reno. I would love to re-use them somehow! What markers do you recommend? Sealant? thank you!! Hi – I love your ideas! I have some odds and ends of white ceramic tiles! 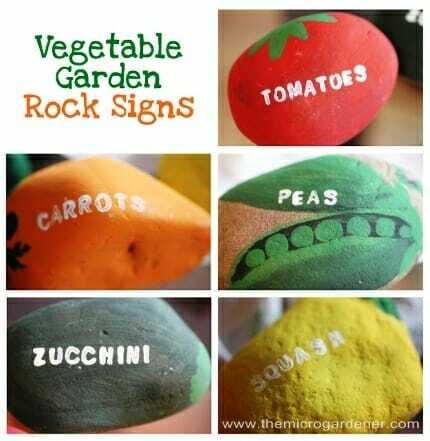 I would love to put them in the veggie garden for signs. What markers do you recommend? Sealant? Thanks again! You could try permanent marker pens which will last for a while (depending on the strength of your sunlight!) or if you’re handy with a fine paintbrush, give that a go. You could also use stencils and spray paint straight onto the tile. 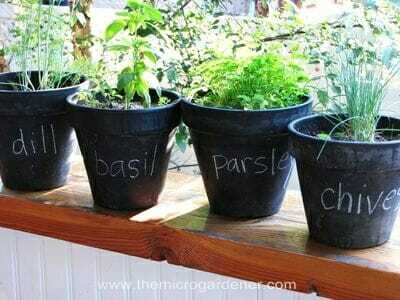 Alternatively, you could use blackboard paint and chalk or wax pencils if you want to change the plant names regularly. 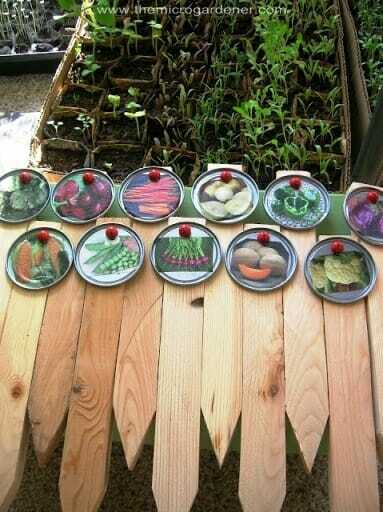 Well, these are really some cool and beautiful markers and labels and that exactly matches with the gardening products and it’s really a great utilisation of markers and labels. Thanks for sharing such wonderful information! I’m always wondering how long since I did something last so I’ve stuck Seed.io tags on some plastic and wire in my backyard garden in Oakland. They let you keep an online notebook to track progress on the planter and have a UV coating. Here’s a like to view the one of the planters in my yard. Thought you’d appreciate it. Thanks for the article. 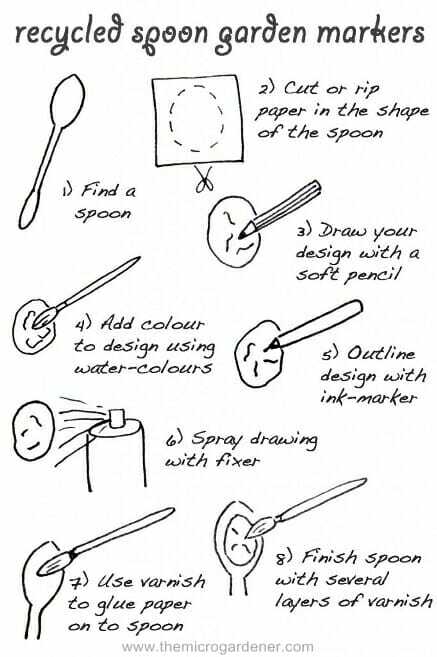 The old metal spoons idea is my favourite. I have some old cutlery that looks old and dirty. I tried everything to clean them but without a result. They are my grandmother’s and I wanted to keep them but they are useless, at least not for eating. That’s why I felt happy with your idea. This way I will recycle the cutlery and will use them for something clever, beautiful and useful. I was wondering if it would work to use a sharpie pen and then either mod podge it or spray it with some kind of clear sealer, would that work out okay, or would you still suggest one of the chinagraph, wax or grease pencils? Also where can I find these? I love the wooden signs in the first picture. Are these available for purchase? If not, are there any step by step directions on how to make them? I guess the part I don’t know how was done was the bleeding of the colors around the edges. I suppose the letters were made with stencils? I believe these are ready made signs but not sure where they are available sorry. Whilst I don’t have a tutorial for these in particular, there are many online that can inspire you with the basic processes for distressing wood and painted finishes with stencils. Here are a couple: http://lovegrowswild.com/2013/07/how-to-create-distressed-signs/ and http://www.fynesdesigns.com/easy-hand-painted-wood-sign-tutorial/. I suggest you also try searching on YouTube. I’m sure you’d find some useful videos to help you with a similar project on there too. If you find something useful, please post the link here. 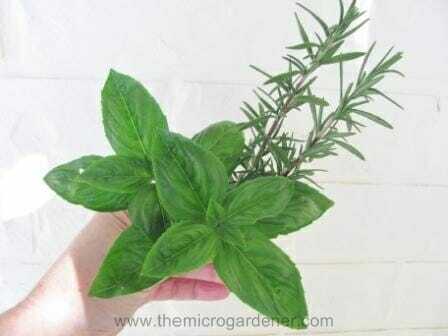 All the best Andrew and don’t forget to post a pic on our community Facebook page to inspire others @ http://www.facebook.com/TheMicroGardener. Absolutely been looking for an excuse to buy a metal stamp set for ages and now I have one, brilliant! I so get fed up with making plant markers that don’t even last till the end of the season before becoming illegible. This is awesome! 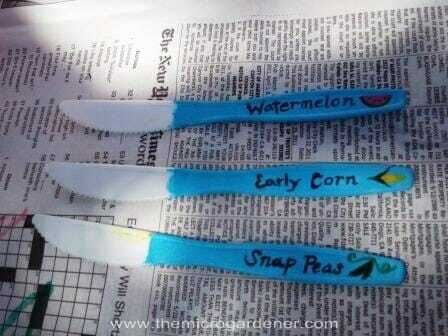 I have so many plastic knives that I do not know what to do with and here you gave me some ideas for it. I truly enjoyed this site. Glad you found some inspiration for upcycling your plastic knives Uma. Have fun making your plant markers! I love this idea, too! I have tons of plastic utensils that come with every take out meal, and now I have a great use for some of them. 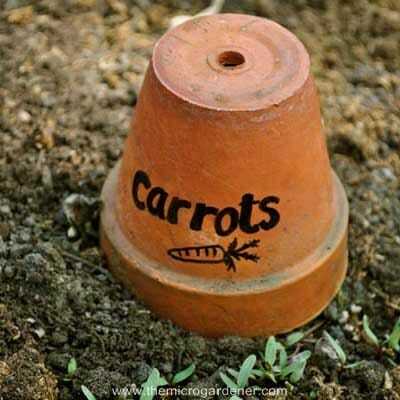 I just planted some bulbs and seeds, so this idea will come in very handy. Wow these are some great ideas! I never thought there would be so may ways that you could label your plants. I really love the rocks and metal spoons. You are FANTASTIC- thank you for your inspirational website. I am so glad I found it- and you are in Qld- a bonus. Please keep up the motivational work! One of the things we use at our local community garden, thanks to a very smart-thinking husband/wife team who garden there, are recycled mini-blind slats! You can cut them to length for visibility, depending on how large an area you wish to mark. Sharpie makes a terrific PAINT marker – medium point black is the one we use – and it’s oil-based paint so lasts and lasts. Easy to write with too; it’s about the size of a fat marker. I’ve always used Yoghurt containers – the plastic is really strong but i remember i have to reapply the writing as the sun disappears them after a while then you don’t know which tomato variety is which. Glad you like the list Sydney Gardener. With the plant ID, perhaps it is the maternal instinct that gives us an advantage over the male species when it comes to recognising plant babies? My hubby has had many ‘learning opportunities’ in our vegie patch like the time he thought he was going to get some brownie points for whipper snipping the ‘grass’ around my herb bed when it was in fact my garlic chive border that got a number one haircut … and the time he made delicious scrambled eggs with what he thought was parsley but in fact was coriander!! The lessons never end around here … love and laughter seem to go hand in hand! Some very natty ideas – having just planted more seeds on the communal plot today and used the white markers (and brought a pile home to clean up) feel inspired to do something much more fun and will try out a few of your ideas to see which the group like. 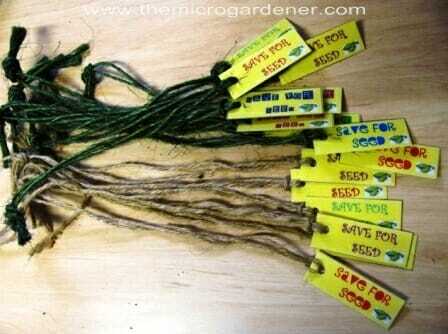 Hope we get to see some pics of your Urban Farm as have just purchased quite a few seeds to do micro greens. Thanks for a great newsletter, my first. Will look forward to more good things. Welcome to The Micro Gardener community … and thanks so much for your comment. I’d love to know where your communal plot is. Having had quite a bit to do with local community gardens including presenting workshops, I’m always interested in how others operate and the plots are set up. 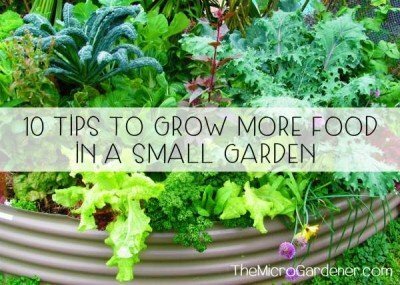 It’s a great way to build community and learn to grow food. Sounds like you might have the perfect opportunity to get creative with your markers and inspire your fellow gardeners! I have a few projects on the go with creative containers so will be sharing some and saving others for my book. You can also see pics on Flickr of some of my gardens. Glad you enjoyed your first newsletter and look forward to staying in touch and sharing more ideas. Hi Deb … thanks for sharing your sign ideas and tips. Wonderful to hear from you. I’ve had the same trouble with ice-block sticks as plant markers – they are only a cheap temporary solution as the wood acts like a wick for moisture. Thank goodness we have heaps of other options. I love the ideas here, they are so pretty. 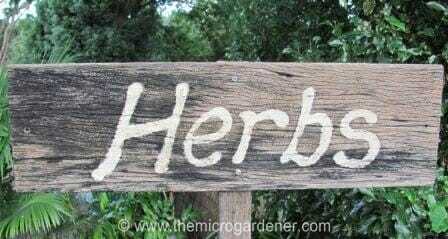 I have had a little sign in my garden for years (around 15) like the one you had made out of an old fence paling. I did it as a bit of a joke at first but so many people commented on it that I have kept it. (It says ‘my farm’ for my 2x5m veggie patch). I used a bit of leftover house paint and that is still going strong. The only thing that has given is one of the screws, so now it swings. I haven’t had a lot of success with ice-block sticks. I found once they got a little wet they went mouldy and unreadable. I have a decent collection of pre-made plastic labels saved over the years for when I start off my seeds in punnets. I have laminated hand made labels and they worked quite well. I have heard that you can cut up and aluminium can with kitchen shears and write on them with a ballpoint pen but I think you would have to be careful of the edges, especially with kids around. This is the most enjoyable website that I have ever encountered. You have such wonderful ideas. I’m not sure how I found your site, but I sure am thankful. Thank you so much for sharing your obvious passion with all of us. Hi Shannon (oh what a great email address you have – Gotta love “Mad Maddy’s Mom”!) … thanks SO much for your lovely comment and for stopping by. You’ve made my day! So pleased you have found some ideas you like. Hang around, there’s more to come. I’ve just come inside from making some kids boot planters out on my verandah and potting up some other creative combinations in containers today that I’ll share in the future. Have a great day. A very inspiring article – we no longer have any excuse for buying the white plastic labels from a shop! Thanks for your feedback and so glad it has inspired some thinking ‘outside the square’! I love looking for new ways with old things … with a little imagination, it’s amazing what we can reuse and save money on whilst still providing a practical function in our garden. Happy plant marking and hope the allotment is blossoming! What great ideas!!!! I just bought plastic white labels, I am going to return them and try one of your ideas. They will make my garden unique. Thanks for the inspiration. WOW!!! I never imagined so many things could be used for labels. All of your ideas sure beat the plain old white generic plastic labels that I have been purchasing for years. Never again….. I’m inspired! !